Terry Butcher says Newport County will be down to the bare bones for Tuesday's League Cup first-round tie at Wolverhampton Wanderers. 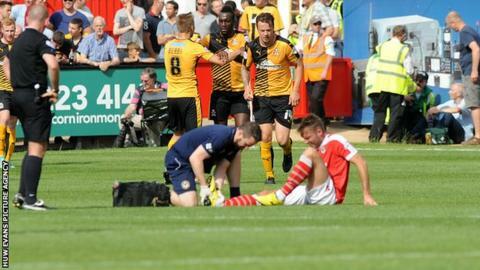 The manager saw his new side lose 3-0 at Cambridge United on Saturday in their League Two opener. The defeat came at the cost of injuries to Kevin Feely, Lenell John-Lewis and Yan Klukowski. "Alex [Rodman] is not too bad but Lenell has tweaked a hamstring so that could be a few weeks," Butcher said. "We've got Yan Klukowski with a dead leg as well, Kevin Feely has torn a thigh muscle... he looks a massive doubt for Tuesday now. "So I haven't got a clue what team I'm going to play Tuesday... we'll assess the walking wounded on Monday and go from there." Newport were undone at Cambridge by striker Barry Corr pouncing for two goals, while Robbie Simpson added a late third for the home side with 10 minutes left. "It's a lesson for the players because Cambridge United are a big, powerful team and play off a lot of set-plays, get the ball forward quickly... so we have to make sure that we can compete better," Butcher added. "I can't fault that players, the effort was tremendous. We've got a lot of injuries and niggles and knocks now from the game, because it was a strong, physical game."